Re: Are there no photos of actual dated artifacts from the 16th -18th century? -- beadiste Post Reply Edit Forum Where am I? A number of what may be called chief beads were recovered from late 18th - early 19th C Sullivans Island (WA) and are discussed in the article by Burgess and Dussubieux in BEADS 19 (shown in Pl. XC). 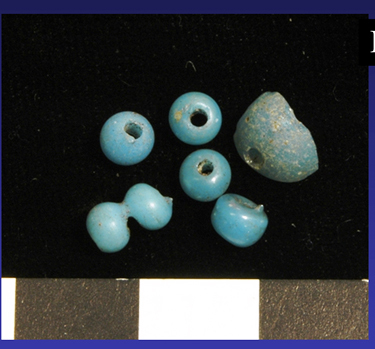 Many variants of opaque blue wound beads were found at the Chinook Middle Village at the Station Camp site: Western Terminus of the Lewis and Clark Expedition, Pacific County, Washington. I saw a prelim report years ago, but apparently nothing detailed has been published on them. Some are shown in "Wilson: Exploring the Chinook Culture Contact at Station Camp at the Mouth of the Columbia River" (1792-1825). One small image shows some of the beads (see attached). The configuration of the two conjoined beads with protruding projections is identical to that described for the furnace-wound beads made in the Fichtelgebirge of Bavaria. Chinese beads usually don't exhibit this feature.